The exact opposite of sterile corporate hospitality, this little inn overlooking Penzance harbour offers just a couple of rooms in a hostelry that hasn’t changed much for a century a least (except for free WiFi, of course). That said, quite how old the existing building might actually be is difficult to ascertain. 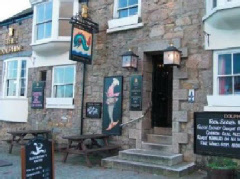 However, it is said that Admiral John Hawkins used the place to recruit local men to fight the Spanish Armada in 1585. Another story which is open to debate is that the very first tobacco to be smoked on British soil supposedly wafted through the air of The Dolphin from the pipe of Sir Walter Raleigh (no smoke without fire, as they say). The inn serves locally sourced food between 11am and 10pm every day and, as one would expect, has its own bar. The attractions of West Cornwall are all within easy reach, including The Minack Theatre above Porthcurno; the famous town of St. Ives; and the family-friendly Paradise Park at Hayle.